Back in the 18th and 19th Centuries the British and French navies espoused different concepts for gunning their ships. The French built large, solid vessels and only gunned them as much as the design would reliably support in all weather, whereas the British tended to cram as many heavy guns as possible onto a design. The result was that often the British ships could not work their lower guns or were topheavy from placing heavy guns high on the hull. The same basic thing happened with US and German halftracks early in WWII. The Germans only placed as large a gun as their chassis would handle with ease, and as a result they mainly used either 3.7 cm or 2.8 cm antitank guns or 7.5 cm howitzers early in the war for fire support. 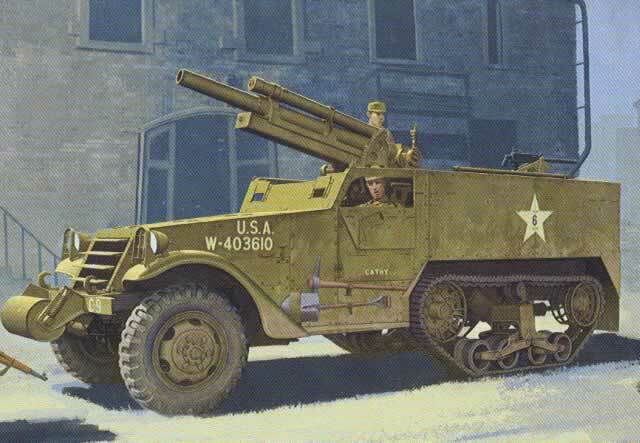 The US, however, jumped right up to the M2 105mm howitzer in October 1941. This caused problems with an overloaded chassis, and while extra bracing was added, it was not a totally successful design. 324 were built through April 1942, and while a handful remained in service through the end of the war, it was quickly declared obsolete and the survivors were converted back M3A1 personnel carriers. The T19 served in North Africa, but while it continued into Sicily and France it was with dwindling numbers as the M7 105mm HMC and later the M4 series 105mm tanks replaced it. Most modelers who are not afficionados of the M3 series halftracks may not recognize the vehicle, but anyone who has ever seen the movie “Kelly’s Heroes” has seen one. The characters “Cowboy” and “Willard” are the crew of a T19 which has some scenes early in the film, later being blown up by “P-47" fighter bombers. DML has now continued its excellent series of American halftracks with the T19, which was an easy conversion for them since they had the yeoman M2/M3 chassis and their nice new M2A1 105mm howitzer to combine. The kit uses many M2/M3 sprues, the upper carriage of the M2A1, and 49 new styrene parts and a new fret of 16 etched brass ones. The kit does show somebody thought more about this one after the lukewarm M3 kit with its needless errors, and comes with the early model M2/M3 armored cab with screws and no jerry can holders (this is from the earlier 75mm GMC kit). A totally new body is provided that also provides the non-skid “diamond” finish on the floor plates and screw-fastened body plates. It also comes with four jerry cans for water (flip-top lids vice the screw types for fuel), new seats, and a cut-down front windscreen armor plate to clear the gun when in travel lock position. Eight 105mm rounds are provided, but are molded in “clips” of four rounds each; this may turn off some but does make them easier to handle and install. A stub axle and mounts are provided for attachment to the M2A1 upper carriage as is a new gun shield (the late production one with with extended protection). The suspension remains the same and the later model bogie mounts with the openings in them are also not present. DML continues to provides a complete drive train including a complete White engine and transmission. While the hood is molded in one piece, DML has notched the back side as well as the insides of the “cab” sides to permit easy cutting to open them up for display. The steering does not operate (no big loss of oversized parts) but is very petite and neatly detailed. This kit offers a choice between the spring compensated idlers and non-compensated idlers with a set of parts included on an “addendum” tree. However, while all sources indicate the frame received extra bracing to support the 105mm howitzer, I cannot find references to it. Suffice it to say the original M2/M3 chassis is provided in the kit. The bogies and track runs remain impressive, as the idlers and drivers are “slide molded” with respectively thin details and openings. Each bogie assembly consists of 18 parts and is very petite; the mounting suspension provides five more with the track tension adjusters nicely portrayed. The tracks are the same with DML having them in hard styrene plastic in two halves, cut in such a way that the “chain” plate drive tooth guides in the center are represented as they are found on the actual vehicle. Since the tracks were metal with rubber “endless belt” casings vulcanized onto them, this is a neat way to portray it. Since these vehicles apparently were not winch equipped, it only comes set up for the roller and no length of nylon string for the cable and chain for the final hook arrangement are provided. The etched brass is minimal in this kit and primarily covers the headlight guards, radiator cover louvers, mud flaps, sliding covers for the view slits, and reinforcement brackets for the roller mounts. A radio is provided but is not shown as used in the directions. The model comes with two Cartograf decal sheets – a targeted set of stars and tactical markings and bumper code “jungles”; once more it oddly it does not come with blue drab serials, but instead yellow is indicated in the directions (and provided). Five suggested finishing options are provided: Four as “US Army” vehicles without bumper codes , with one named “Cathy” and another “Battering Ram”, and one with the 7th Regimental Combat Team, 3rd Infantry Division, Rabat, Morocco, 1942 (olive drab with US flags and the name “Evelyn”). As before, I strongly suggest getting David Haugh’s “U.S. Half-Tracks”, Steve Zaloga’s “US Halftracks in Action” from Concord or Jim Mesko’s “M3 Halftrack in Action” from Squadron/Signal as they all provide a lot of photos and good information for finishing. Overall, this is a much more thoroughly thought through kit than the M3 and should prove popular with US halftrack fans. C 17 M3 series halftracks detail parts - mine racks, etc.